From Senet to a selfie in just 4,000 years! 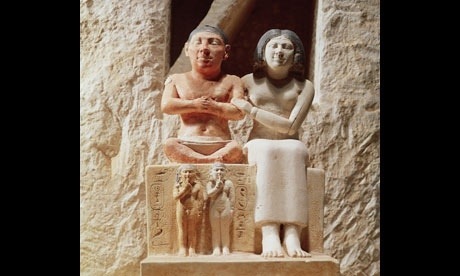 Above is The Dwarf Senet with his loving wife beside him and his two children standing in for his legs. This could be the earliest form of portraiture sculpted in Ancient Egypt more than 4,000 years ago. The Greeks and Romans continued the tradition but it was during the Renaissance that portrait painting really came in to its own. Since that time portraiture has adapted itself to every kind of ‘ism’ in painting and photography with the “selfie” being the latest form. 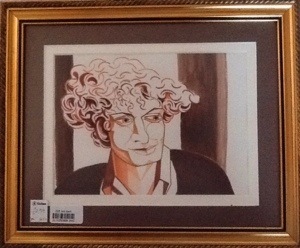 My next painting is definitely a portrait but there are no clues as to who it is or who it was done by. It could be a man or a woman. Does it matter? In any case it is a handsome example. It is done in a Cubist style and with pen and ink and I really like it. I think the artist captured something interesting and was clearly talented. It only cost me £2.99.